Here in the Media and Oral History Unit of the Richard B. Russell Library, we spend a lot of time thinking about the best ways to make our oral history interviews available to the public. Historically, researchers relied solely on printed transcripts of oral histories, and oral historians and archivists often destroyed the original audio recordings after transcribing an interview. Transcript was king. Today, however, new technologies and the Internet make it much easier to share original media. So, while transcription is still considered the "best practice," there's a growing sentiment that actually listening to or viewing the original interview should be an integral part of interacting with oral history. There is a lot of debate in the oral history world over the advantages and disadvantages of transcribing interviews—much of it centered on the skill and labor needed to create a quality transcript. At the Russell Library, we’ve been able to transcribe many of our interviews from the Reflections on Georgia Politics series, but we recognize that we can't do this for all of our collections. One way we endeavor to make our interviews accessible is by posting videos on YouTube, where we hope to reach as wide an audience as possible. This morning as I was poking around our YouTube account, I noticed a small icon just above the video description. Apparently, it’s actually a Transcript option. Figure 1: Transcript icon below the video description. YouTube now offers a captioning or transcript option with videos uploaded to the site. They use a speech recognition and processing algorithm to actually create video transcripts from scratch. While automated transcription is not necessarily a new development—there has been much effort over the years devoted to creating transcripts with speech recognition software—what is novel and exciting is that YouTube is creating these transcripts automatically, for all videos, and then linking the transcripts to the timecode of the interview video. So by clicking the "CC" (Closed Caption) or Transcript icons on any YouTube video, you can simultaneously watch a video and follow along in the transcript. And by clicking on a particular point in the transcript timeline, the video will skip to the corresponding segment, and vice versa. Figure 2: Example of YouTube automated transcript. And—even more exciting for us—YouTube will allow us to upload our own transcripts for each video. After we upload our files, YouTube processes our transcripts with their algorithm and links the transcript to the video's timecode. 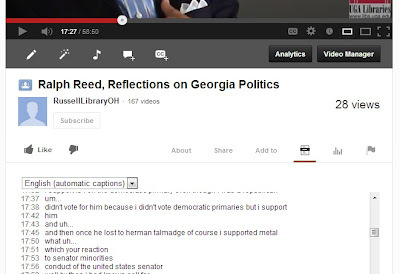 This means that when you're looking at one of our Reflections on Georgia Politics YouTube videos, you can enable the transcript or closed captioning and follow along in the transcript window below the video. This might help you figure out what a narrator is saying ("what was the county, again? "), or you could do a keyword search with the ctrl + F function on your keyboard to see if a specific topic or person is mentioned. It also means that our videos are more accessible for hearing-impaired individuals. 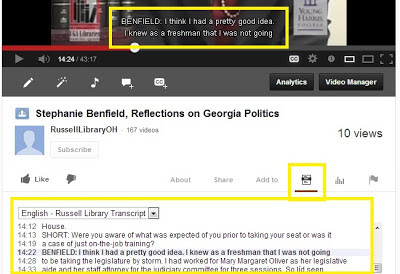 To see a couple of examples of videos with our added transcripts, check out the Reflections on Georgia Politics interviews with Hugh Gillis and Stephanie Benfield (just click the Transcript icon to follow along). Of course, this doesn't mean that YouTube is doing all of our work for us. We can upload the transcripts that we have, but most of our videos will only have the YouTube automated transcripts. 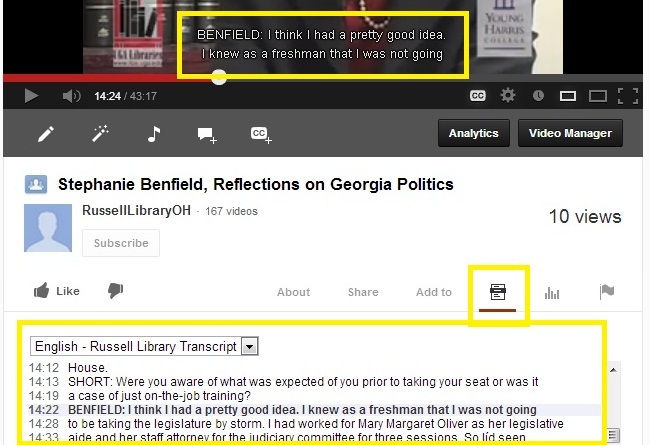 Like most transcripts made with speech recognition software, the YouTube automated transcripts are rife with errors (at one point they transcribe "Young Harris College" as "billionaires college," at another point "you know hairs college"), while our transcripts are much more accurate—having been created and audited by multiple staff members over hundreds of hours. But at the same time automated transcripts accurately catch some important terms (apparently even YouTube usually recognizes the names "Zell Miller" or "Herman Talmadge," even when spoken in a Georgia drawl). And, as they sometimes say, something is better than nothing. For us, the automated transcripts are an unexpected bonus in our efforts to make our interviews more discoverable—and an exciting new way to allow the public to interact with oral history.